omar berakdar, a syrian photographer and media artist, chemist and also studied media art history at Donau University in Krems, Austria. He co curated and participated in several artistic events in Syria and Istanbul where he arrived in 2012, collector and also active in efforts to preserve photographic heritage within MEPPI project, he is the initiator and one of arthere team. saliha yavuz independent art manager based in istanbul and one of arthere team, graduated from yildiz technical university art and design faculty art management program. She worked for several galleries as an artist liasion, co-founder of Grizine online art and culture magazine, founder of artwalk istanbul, studio manager of taner ceylan and working for are art collection. she is also member of neola art projects (germany) and liasion for the cultivist. claire fondain is a french who works in the domain of art management. she arrived in turkey in 2015 to stay few months. she started to work in a cultural association to organize different projects in france. passionate of art, practices photography,documentary work among other activities. gülsün oykü dogan, artists, graduate from the economic department in eskisehir anadolu university, after her graduation, she started to work in illustration, graphic design. in her artworks, she's inspired by her anger, her sadness and express her feelings, her conflicts and most of the time her childhood. in her drawings, she likes to use "woman body" in a ironic way to criticize patriarchal world. she is one of arthere team and one of the artists presented by arthere. 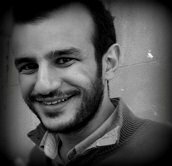 Waseem Al sharqy is a Syrian writer and Theater-maker based in Istanbul. Graduated from the higher institute of Dramatic Arts in Damascus Theater studies department he has participated as a Dramaturg in several Theater projects which were performed in Damascus, Beirut, Tunisia, Algeria and Istanbul. His novel the “Al Hajeb” was published in 2015 from “Al Saqi” publishing house.